Howe had competed for the crown two years previously and finished as second runner-up. Now, she’s happy she didn’t win earlier. 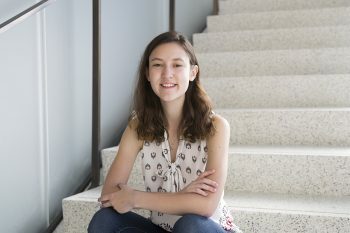 “I was still in second year of engineering, and looking back, I learned so much in third and fourth year that I can now apply,” she says. 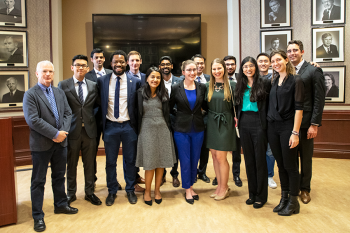 “A lot of that experience came through my capstone project,” designing a sustainable sanitation facility that uses waste water technology under the supervision of Professor Mark Fox (MIE). 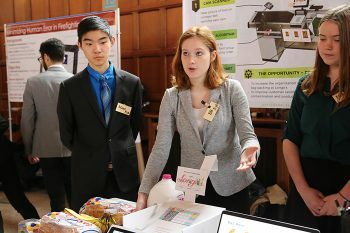 During her time in U of T Engineering Howe was an active volunteer at recruitment and outreach events for the Department of Mechanical & Industrial Engineering, and she has long been a vocal advocate for encouraging women and girls to see themselves in science, technology, engineering and math (STEM) disciplines. On November 26, Howe will represent Canada at the Miss Universe competition. Before she heads to Las Vegas, Nev., Howe spoke with Marit Mitchell about why she chose engineering, tired stereotypes she’s faced, and the exciting year ahead. This interview has been edited and condensed. Why did you choose to study Industrial Engineering at U of T? I was initially planning to join the Engineering Science program, with the intention to focus in biomedical engineering. Despite being passionate about biomedical engineering, I was nervous that it would be too specialized if I wanted to switch to a new sector. About a week before my start date, I came across industrial engineering and was drawn to the fact that it could be applied in a multitude of industries — the combination of optimization and human-centered design caught my attention. I really enjoyed the idea of taking creative engineering solutions and ensuring that they would be applied to impact the people they were designed for. How do you think your engineering education has prepared you to work towards and achieve your goals? I learned to love coffee! As much as it’s a joke, it really isn’t. Earning a degree in engineering requires determination and hard work. Aside from what we learned in our textbooks, one of the most valuable aspects of an education in engineering is the ability to be given a problem that you have no idea what it is about, then have to work hard to decipher it and come up with a solution. That’s what I feel sets engineering programs apart — when given a problem to solve, you have no time to think ‘this is impossible’. You find a way to make it possible. You have been a vocal champion for women and girls in STEM. What motivates you and how do you hope to advance this cause? I faced a number of stereotypes growing up. One of the things I’ve heard over and over is, “Oh, you don’t look like a typical engineer,” and this never really made sense to me. Is there truly a “typical” engineer? No. It doesn’t matter who you are, what your background is, what your gender is or anything else. You have the privilege to choose to study whatever it is you want to study. I am a personal advocate for women and girls in STEM for a number of reasons. First, girls in middle school and high school are faced with critical decisions early on, when it’s time for them to select courses. Unfortunately, many of these decisions can restrict your options when it’s time to apply to university. For example, I never studied Grade 12 physics, which prevented me from applying directly to engineering programs. I was fortunate to be able to make it up later after I decided to apply to engineering in June of Grade 12 — it was a very narrow window to be able to enter my chosen field! But what happens to the girls who choose not to take science in high school? It’s critical that we offer the opportunity to girls to explore STEM disciplines early on, as early on as elementary school, in order for them to be aware of what they are capable of accomplishing in these fields. Secondly, equality for women in STEM is still a battle being fought. Not only is there a gap in the number of women who are working in STEM fields, but also a gap in pay between men and women. Part of this solution comes from what can we do now. Young women will likely be much more drawn to STEM fields if we can show that we aren’t afraid of the challenge ourselves. By having female mentors that are inspiring and accessible, we pave a path for generations to come. Regardless of the outcome in Las Vegas on November 26th, what are your goals for the next year? Of course leading into Vegas, I’m focused on making Canada proud and bringing home the title. No matter what happens in Vegas, I want to spend the next year continuing to advocate for women in STEM, launch my business (within the financial technology sector) and some other exciting projects. That’s all I can share for now, but stay tuned!